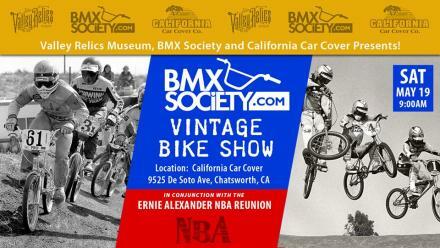 Registration for the BMX Society x NBA Reunion Vintage BMX Show is now open. Registered attendees are NOW ABLE TO SET UP YOUR SHOW BASE RIGHT AT YOUR CAR. In other words, if you are registered you will be able to pull your car right into the show and set up. Non-registered attendees will park on public streets or unused commercial lots a short walk from the event. This is Phase 2 of the 2 phase weekend. Phase 1 is the May 18th "Roast & Toast" Friday evening. That is a separate event with it's own tickets available through EventBrite. WHAT DOES THIS MEAN? WHAT DOES REGISTRATION GET A PERSON? **Registration GUARANTEES a space to set up your stuff on Saturday, May 19th. It allows you to stay right beside your vehicle. 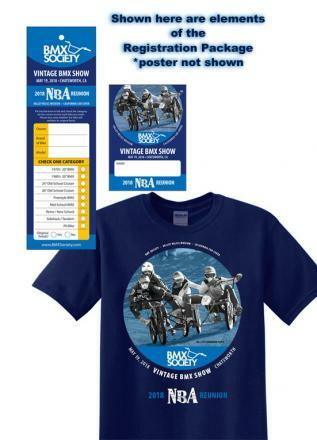 **Registration makes your vintage BMX bikes eligible for awards in the bike show. 2) Hangtags for up to UNLIMITED bikes in the show. There is a paypal button in the first post of this thread. Choose your shirt size and pay. That's it. I THOUGHT THIS EVENT WAS FREE? It is! You are welcome to come and walk around, bring your whole family and all your friends. CAN I JUST BUY A SHIRT? Yes, there will be limited supplies on hand the day of the show. WE ALWAYS SELL OUT. Pre-Reg assures you you will get yours. HOW DO I GET MY REGISTRATION PACKAGE? You pick it up the morning of the show starting at 9am. Yes, Registered users can also set up swap stuff, and set up near your vehicle. This privilege is solely for registered attendees or those who have made arrangements to be an official vendor. THERE WILL BE REGISTRATION AT THE EVENT. HOWEVER SHIRT QUANTITIES ARE LIMITED and Posters are pre-registration ONLY. 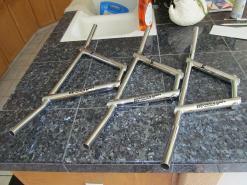 Attendees with Bikes in the bike show, vying for honors MUST register. Only people who register will be eligible for honors and the awards. Registration allows you to enter as many bikes as you would like. Attendees who would like to enter bikes in the show must be registered and set up by 11 am. Judging will begin at 11:30 am. First please note that we are not in a park this year. We are on pavement and asphalt. Spaces are more confined, so we won't be able to sprawl like in past years. It will be more like typical swap meets. As anyone can attest that has ever been to one of this site's events... the BMX Society's Reunion & Show is truly BMX nirvana. People literally come from around the world. You see the best bikes, hangout with the coolest people, rub elbows with the stars of racing, freestyle and the industry. There will be a food truck and a shaved ice vendor, there is a 7-11 across the street. Feel free to bring a cooler with food, but we don't have grills this year. Come prepared with plenty of drinking water. It will almost certainly be a warm, sunny, so-cal day, so stay hydrated and happy. Also... bring sun screen for you and your kids. This is a family friendly event. All are welcome, but please keep an eye on your kids and don't let them get jelly on somebody's $500 og pad set, or knock over a row of priceless show builds. • Your full mailing address. c/o Steve Brothers3512 E 1st St.
Pre-reg mail ins must be post marked on or before May 9th! If you want a shirt please pre-register. We will have a limited number of shirts available the day of the event, but we ALWAYS sell out. Last year we sold out at 10 am. Pre-register to guarantee that you get what you want. The event will open a 9 am. People taking part in the judged bike show must pick up their registration pack and have their bikes set up for judging by 11 am.The bikes will be judged from 11:30 am to 1pm.